Japan’s Kyocera and Century Tokyo Leasing Corporation just started construction on its long planned 13.7 MW floating solar installation on the Yamakura Dam reservoir – the largest floating solar installation in the world. However, floating solar panel installations (also called “floatovoltaics”) have also propped up in the U.S in the past five years. “Floatovoltaics” are floating photovoltaic (PV) solar panels, which are convenient to install in areas with limited land availability. The cost of leasing water for solar installations is lower than that of land. Therefore, floatovoltaic systems are ideal for dams, reservoirs, and water utilities that are high energy consumers. Other benefits of using solar panels on water are: reduced evaporation, reduced algae growth, and increased electric productivity due to the cooler temperature of the modules. The national average cost of solar installations is $2.8 per watt ($/w) as of 2014. Solar panels are considered to have ~20% efficiency for about 25 years. The increased efficiency of solar panels when placed on water, along with the lower lease prices of water compared to those of land, make floatovoltaics potentially more competitive than many renewable energy technologies, such as wind technologies (high land costs) and hydropower (potentially high environmental costs). The global floating solar panels market is valued at $3.89 million in 2014 and is expected to grow. In addition, floating solar panels are eligible for any federal and local grant incentive programs. Current projects in the U.S. The world’s first large-scale floatovoltaic system was installed in Napa Valley, California in 2011 on the Far Niente winery by SPG Solar. SPG Solar installs solar systems for homes and conventional operations, and brought to market the Floatovoltaics® commercial model as a competitive alternative to conventional, land-based solar installations. The installation produces 400 kW at peak output and was funded by government rebates and tax credits, amounting to $4 million in total costs. The solar panels reduce evaporation by 70%. The floating solar farm provides a convenient alternative to eliminating productive vineyard space. It generates power alongside an on-land solar farm, and the combined installations completely offsets the winery’s annual power usage. A floating solar installation in Sonoma County, California is scheduled to come online in 2016. The project partners are Sonoma Clean Power and Pristine Sun, which leases the ponds for the installations. The installation is 12.5 MW in capacity and will power 3,000 homes. 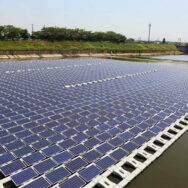 It is expected to be the second largest floating solar farm in the world following Kyocera’s in Japan. While its installation and operation costs are unknown, its leasing costs for the ponds are $30,000 a year. Sonoma Clean Power provides two customer service options: CleanStart and EverGreen. The first plan costs customers 7.1 cents per hour in exchange for 33% renewable energy power supply, and the latter provides 100% renewable energy for an additional 3.5 cents. Sonoma Clean Power’s residential plans provide an alternative to the Pacific Gas and Electric investor-owned utility. Another installation has been installed at the Canoe Brook Water Treatment Plant in New Jersey by Eneractive Solutions. It is 135 kW in capacity and made up of 538 solar modules. The installation produces 135,000 kwh per year and saves $16,000 annually in energy costs. The installation costs were $1.35 million, some of them offset by solar tax rebates integrated in the American Recovery and Reinvestment Act. Installing solar panels on water comes with the challenge of maintaining the panels – as water can erode the material – and building power cables underwater. However, many storage ponds are located near distribution lines powering large pumps, which lowers interconnection costs. Lower leasing costs, decreased water and energy costs, and increased electric productivity can make floating solar farms more competitive than their land-based counterparts. Floating solar farm installation is already being carried out on a global scale by international joint ventures in Hawaii, India, Japan, and the UK. Very interesting. One error in the piece, though: solar panels are not “80% efficient”, but more like 20%. In other words, of the solar energy hitting the panel, 20% is converted to electricity. Yes, thanks for catching the error!